What's the Price for the 2018 Porsche Panamera? 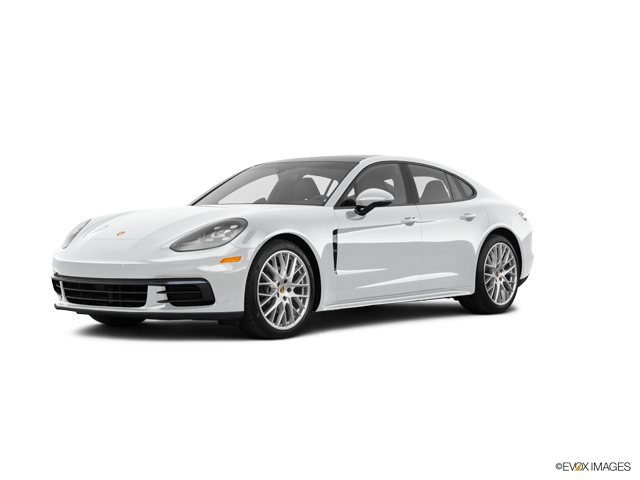 If you’re looking for a luxurious and high-performance sedan that beats the competition in terms of powertrain options and styling, then consider the 2018 Porsche Panamera. In 2017, the Panamera saw a complete redesign from the bottom up, a new engine lineup, and new interior comfort, convenience, and technology features. Compared to previous models, the front fascia has a sportier feel, the lower grille features a new redesign, and the LED turn signals are integrated into the corner air inlets. For the 2018 model year, Porsche adds two new models: the wagon-like Sport Turismo and the fuel efficient Turbo S E-Hybrid, a plug-in hybrid that boasts a combined 680 horsepower. Under the hood, the Porsche Panamera is powered by an impressive powertrain lineup. First is a 3.0-liter turbocharged V6 engine that puts out 330 horsepower and 331 lb-ft of torque. This engine will get you an EPA estimated 21 city and 28 highway miles per gallon. For more horsepower, next in line is the 2.9-liter twin-turbocharged V6 engine in the 4S models that boasts 440 horsepower and 405 lb-ft of torque. Drivers will be impressed with the EPA rating of 21 city and 28 highway miles per gallon. Step up to Turbo models and you will be treated to a 4.0-liter twin-turbocharged V8 engine that puts out an impressive 550 horsepower and 567 lb-ft of torque. For greater fuel efficiency, drivers can choose a 2.9-liter twin-turbocharged V6 that’s paired to an electric motor to produce a combined 462 horsepower and 516 lb-ft of torque. It has an EPA estimated 22 mpg combined and a 46 MPGe combined rating. It can run up to 16 miles on a charge alone. Lastly, for the most exhilarating driving experience, drivers can choose the 4.0-liter twin-turbocharged V8 engine paired with an electronic motor in the S E-Hybrid model. It boasts an astounding 680 combined horsepower and 626 lb-ft of torque. It also features a remarkable 49 MPGe combined rating and can drive up to 14 miles on an electric charge alone. Step inside the 2018 Porsche Panamera and you will be treated to the epitome of luxury. It’s interior is packed with rich accents and luxurious materials. High tech features abound in the Panamera; the most noticeable being the large navigation screen and central tachometer. When you choose the Porsche Panamera, you can expect a plethora of standard equipment. Favorite standard features include a panoramic glass sunroof, front and rear parking sensors, 8-way power-adjustable and heated front seats, dual-zone climate control, 10-speaker premium audio system, and navigation. Turbo models get the added benefit of LED headlights, adaptive air suspension, 14-speaker Bose audio system, full leather interior, Alcantara roof lining, 14-way power-adjustable front seats, and heated rear seats. Among the many optional features are the 21-speaker Burmester audio system, rear-seat center console touch screen display, adaptive cruise control, heated steering wheel, ventilated front and rear seats, ceramic-composite brakes, infrared night-vision camera, Lane Change Assist, Lane Keep Assist, and 4-zone automatic climate control. When it comes to power, performance, and luxury, you can’t beat the new 2018 Porsche Panamera. We invite you to visit Porsche of Nashville to schedule a test drive and compare the Panamera to the competition. Our friendly and professional sales representatives will help you compare models, trim levels, and provide you with a list of customizable features to ensure that you drive off our lot with the Porsche that suits your unique needs and lifestyle best.